Rick Passek's has been a fisherman for more than 90% of his life, so it's no surprise that he feels most at home on the water or a shoreline. Rick began fishing as a toddler, learning from his father on the world famous Bow River in Alberta. In his teens Rick enjoyed ocean fishing, but as he spent time on the lakes and rivers of BC, he discovered and thrived on the unique skill and challenge that fly fishing involves. Rick Passek will tell you that knowing about the natural insects that the fish eat is the number one most important thing to learn to become a good fly fisher. Listen in to find out everything you wanted to know about the bugs that live in stillwaters. Displaying a passion that earned him the title of "FlyFish Fanatic", Rick poured over reference material and attended every course that he could find, then spent countless hours practicing and honing his skills, both at casting and tying flies. Not content with simply going through the motions, Rick began studying entomology to properly understand and respect the science behind the sport. It was during this time of intensive research that Rick discovered that there was plenty of fly fishing information available, but not much was written in an easily-accessible, fun manner. He had hoped to find something that taught the basics along with useful tips and tricks, like an experienced fisher teaches a good friend. Like his father, Karl, had taught him. That's why Rick started Rp3 Fishing Adventures and the Rp3 FlyFishing School, and beginner and novice fly fishers have been benefitting from his knowledge ever since. Rp3 FlyFishing classes and seminars cover everything from theory, knots, lake and river tactics, to hands-on casting and fishing etiquette. Rp3 Adventure Packages aren't just focused on the act of fishing - they're opportunities for families and friends to learn together and share an entire, memorable experience in the outdoors. Most recently, Rick has become the author of the Freshman FlyFisher book series, providing easy to read information for new fishers, complete with handy illustrations and photos. The books cover all of the fly fishing basics and tactics, and dispel any lingering myths about the sport; a sport Rick insists "is really for everyone." Rick Passek is a still water specialist who has shared his fly fishing knowledge and experience on the BC Outdoors "Backroads Tour"", in classrooms and trade shows, and on television and radio appearances including The National Weather Network, Breakfast TV, CBC Radio, and the award-winning Urban Rush. His work has been in BC Outdoor Magazine, and can be found online in many fly fishing forums and, of course, at his popular web site and blog, www.rp3flyfishing.com. Rick is a proud member and supporter of groups such as the FFF, the BCFFF, Trout Unlimited Canada, FlyBC, and Fishing with Rod. When he isn't fishing, teaching, or writing, Rick is expanding his vast knowledge of entomology and relaxing with his wife and son at his home in British Columbia, Canada. 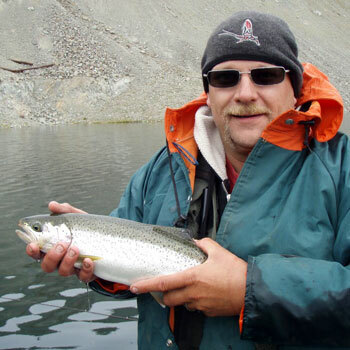 To learn more about Rick Passek's guide services, school, and books visit his website, www.rp3flyfishing.com.